I remember when the cover of a book used to mean something. When you could look at the cover of a book and know exactly what you were getting. If you saw a gleaming chrome spaceship over the shoulder of an intrepid, chiseled explorer holding a ray gun, you didn’t even have to buy the book and read it because you knew exactly what the story would be just by looking at it. But you bought it anyway! And you read it, and liked it! Because that book was an objectively good book, and you knew it by looking at it. People used to know how to tell stories back then. They knew which plot was the good plot, and they used that plot. They knew what dialogue was supposed to sound like. Sometimes I buy a book today and the dialogue is different than in other books. People, if I wanted different dialogue, I’d read something else. Stop signs. Trees, maybe. I don’t know. Not books! Books are supposed to be one way, not another way. The cover of The Monster at the End of This Book is full of false promises and overblown hype, just like a woman. I remember when if a book told you that there was a monster in it, you knew what you were getting. There would be a hero who didn’t make any namby-pamby wishy-washy apologies for being a hero. There would be a princess or dame or broad of some description and she would be beautiful and love the hero after saying many times that she doesn’t, because he loved her and love conquers any objection. There wouldn’t be any of this pandering PC crap that people spout just to get cred with the in-crowd. I know we all hate that, right? Pandering, right? It’s awful, right, when people pander? When they just say what they know is safe and popular, just repeat what their audience wants to hear? Well, I for one have the guts to stand up in front of an audience of people who hate that, and say that I hate it, too, and I don’t care who in my intended audience knows it! So I can tell you that according to the last page, the blue wimp is the monster. Allegedly. Typical self-flagellating gamma male posturing. Don’t you know that ALL men are monsters according to the Feminazis? Agreeing with this sexist sentiment is the only way a pathetic gamma male like this “Grover” character (named after Demo(n)cRAT president Grover Cleveland, I suppose) has of getting laid. I got news for you, Quisling: your complicity will not save you. The foundation of all modern feminism is in gender abolition radical feminism. I did some digging and it turns out this book was produced by an entity called the “Children’s Television Workshop” and now known as the “Sesame Street Workshop”. Well, if you consider that children are tiny people, you might get a better name for it: People’s Television Workshop. This indoctrination factory produces books and television shows and movies and games for your children using your tax dollars. They air their main shows on PBS (or as I like to call it, “Public BS”), in case you needed any proof of the socialist agenda that underpins this thing. They’re targeting your children The whole thing is straight out of a Saul Alinksy Rules For Radicals-style playbook. 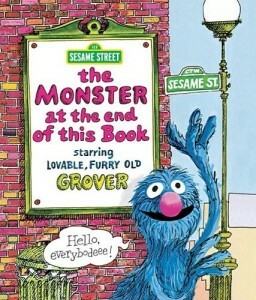 Also, apparently this Grover character is a Muppet. A family entertainer like Jim Henson must be turning over in his grave to know that his creations have been turned to a leftist political purpose. Misandry and the promotion of a culture of fear and illiteracy are what you get if you buy this book. Since I already have a copy, I’ve decided to give it to my kids just so they know what they’re up against. I am pleased to report that they have read it through a dozen times and show no signs of stopping now. They laugh when the blue gamma cuck tells them to stop reading. They laugh right in his stupid, weak face. You hear that, Saul Alinksy? Your little gambit failed! What was supposed to be an indoctrination manual for the left turned out to be a training ground for those who love freedom! We the living read what we want, and we don’t stop just because some emasculated Feminazi puppet-man tells us to. This entry was posted in Noisy Nonsense, SPRB and tagged puppygators, satire, sprb by Alexandra Erin. Bookmark the permalink.